The System Sensor 5621 is a 5600-series, 135°F fixed temperature, rate-of-rise, dual-circuit, mechanical heat detector with plain housing. 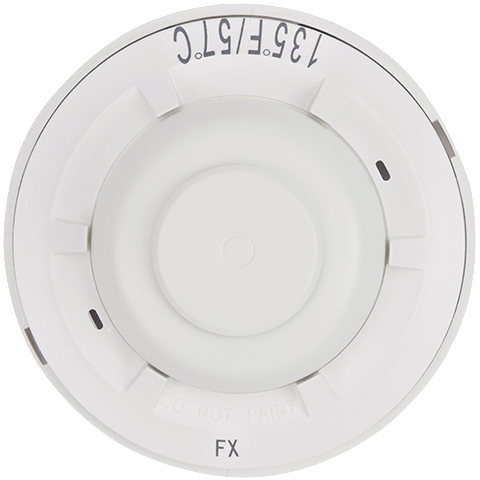 The 5621 detector offers a low-cost means for property protection against fire, and for non-life-safety installations where smoke detectors are inappropriate. Add the hardwired 5621 heat detector to most existing alarm system control panels. To satisfy a variety of installation needs, the 5621 easily mounts to single-gang and octagonal back boxes. And the 5621 accommodates four-square back boxes, when used with a square to round plaster ring. The reversible mounting bracket permits both flush and surface-mount back box installations. The 5621 provides clear markings on the exterior of the unit to ensure that the proper detector is being used. Alphanumeric characters identify the activation method, as well as the temperature rating, in Fahrenheit and Celsius degrees. The 5621 is a combination fixed/rate-of-rise unit and is clearly marked FX/ROR. The 5621 detector also provides a post-activation indicator in the form of a collector. When the detector is activated, the collector drops from the unit, making it easy to identify the unit in alarm.